The size of a Crate or Pet Den is very important. Too big and it will not work as a tool for house training, to small and the dog will feel trapped and uncomfortable. 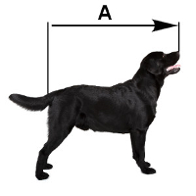 With the dog standing tall and proud on all fours, take measurement A, from the tip of their nose to the base of their tail. I stress to the base of their tail, NOT the tip as this would make the crate too large! Now add 5 or 6 inches (12 to 15cm) to A and you’ll have the perfect length of the crate for them to stretch out and move around without having too much space. Next, because sone dogs are taller in a seated position than they are standing on all fours, sit the dog down so they’re sitting pround and upright. 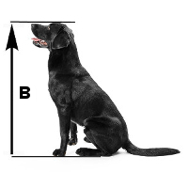 Then referring to the image, take measurement B, from the floor to the tallest point on the dog. Again, add 5 or 6 inches to this and this will give you the shortest height the crate should be. You need a crate that is A + 5 inches long, and B + 5 inches high. The width will be in proportion to these measurements so you don’t need to worry about this. The Great&Small Wire Pet Crate Den with easy and safe access, easy to clean and can be stored flat to save space or Great&Small Soft Grey Pet Den stylish and versatile, perfect for travelling with your pup.